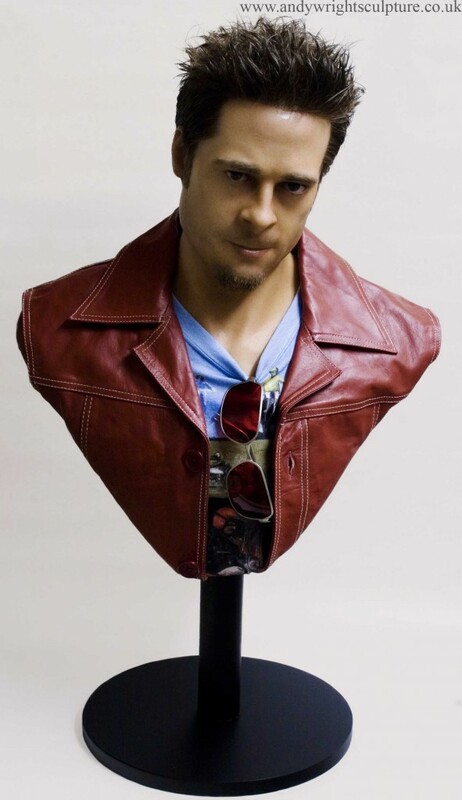 Life size portrait of Brad Pitt as Tyler Durden from the cult film Fight Club. 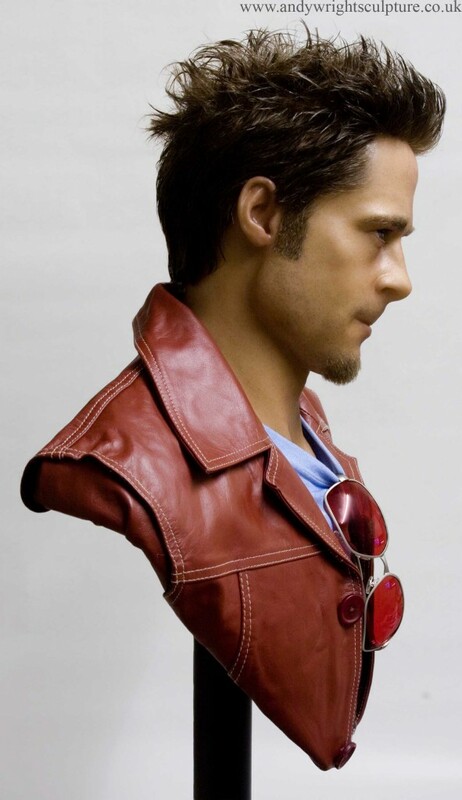 To start the Tyler Durden bust, I first collected a number of photos to work from from various angles of Brad Pitt, along with some screen captures. Once a pose and expression was decided on, I built a simple metal armature to support the subsequent clay. The clay used was water based potter’s clay, and was applied and shaped to build up the rough form. 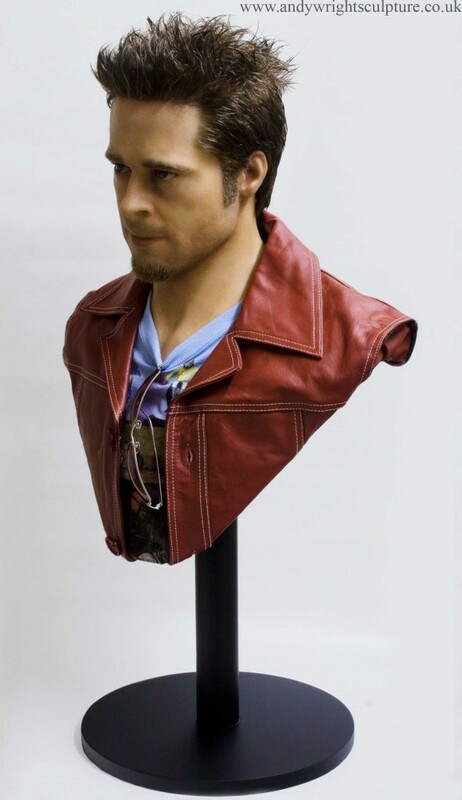 I then detached the head and worked on that seperately until I had a straight portrait of Brad. It was then adjusted to get the untypical expression we wanted for this character. Once happy, a sealer layer was applied to the clay. Next a fibreglass mould was made in sections, and a silicone version of the head produced supported by a fibreglass core. After removing any seams and cleaning, he was painted in a number of translucent layers to simulate skin. 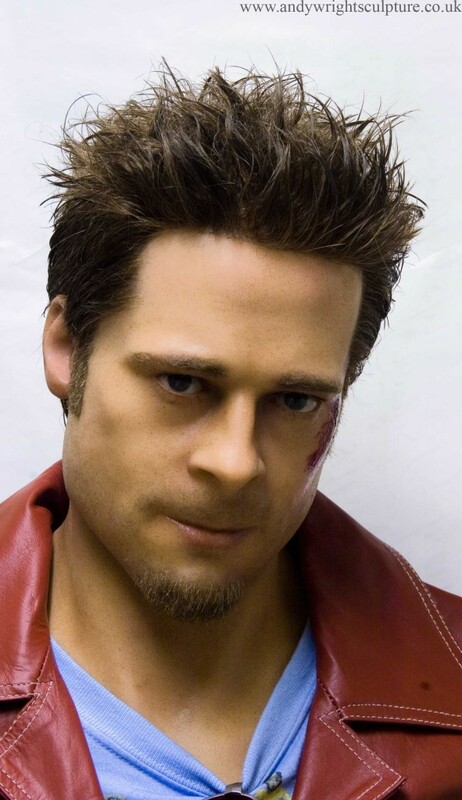 Individual hairs were then implanted one at a time for his scalp, beard/stubble, which was then trimmed and styled. Eye brows and eye lashes were similarly implanted individually by hand. Acrylic hand made eyes were then fashioned to match his own and inserted, and he was finished off with a painted t-shirt [as the original t-shirts are long gone], as well as a leather jacket and replica sunglasses.